My 2 sisters and their family living in Australia and Riyadh went home for the Christmas holidays few years back and it was the time we're all complete (sans my dad). Nothing compares to the bonding times that we had as a family. Since we are complete, we decided to have a family portrait that we all can keep. 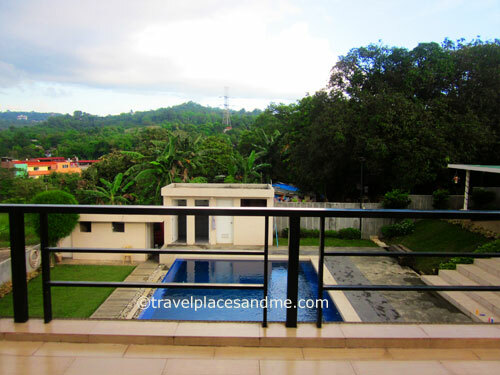 Looking for a place where we can have our photoshoot, my sister stumbled upon LOUISSE PRIVATE RESORT online, which happens to be just near our place. She browsed their website and inquired while she's still in Riyadh. I was the one who was assigned to contact them through phone and I immediately book a slot for us. I called them via phone, reserved a slot and paid the downpayment at BPI. 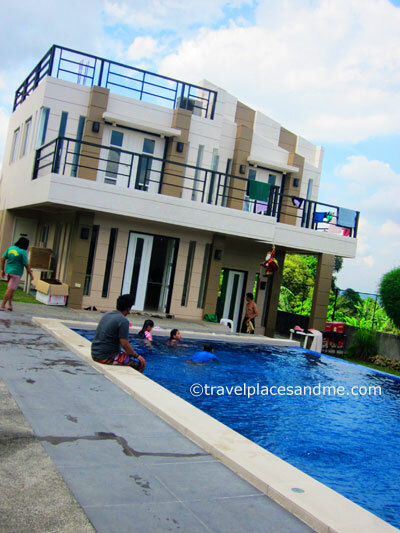 We took the 22 hours reservation that is from 7:00pm-5:00pm for P21,000 and luckily we got the DEC. 25 (yes, Christmas day) - Dec. 26 slots for our photoshoot and swimming too. We also did visit the place few days before our reserved date to see if it nice and we're impressed upon closer inspection of the place. We had our Christmas Party at the resort: opening of gifts and family picture taking were indeed so much fun. A karaoke was also available for us to sing while wi-fi is available but it is weak that we can't even connect. We stayed up a bit late singing at the karaoke and exchanging stories, jokes and all. Since we are having a formal photoshoot the next day, we woke up early around 5am because the make-up artists are already there. We are clad in red formal dresses and with our nice make-up on. We took the photography services from GREAT IMAGE at SM Taytay. A professional photographer and his assistant came to the resort as well to take photos of us. (Sorry, but i will not be sharing our family photos here). Their service took around 2 hours. 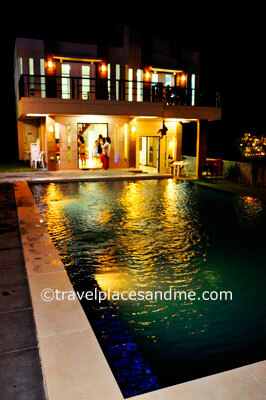 After the photo session, we are already itching to dip and dive into their pool. In no time, most of us are rushing and swimming at the resort's pool. We had up until 5pm to stay at the pool swimming, singing and having fun at their nice resort. The water was a bit cold at their infinity pool that time so I didn't stay much in the pool, but the kids and the teens have so much energy swimming and staying in the water. 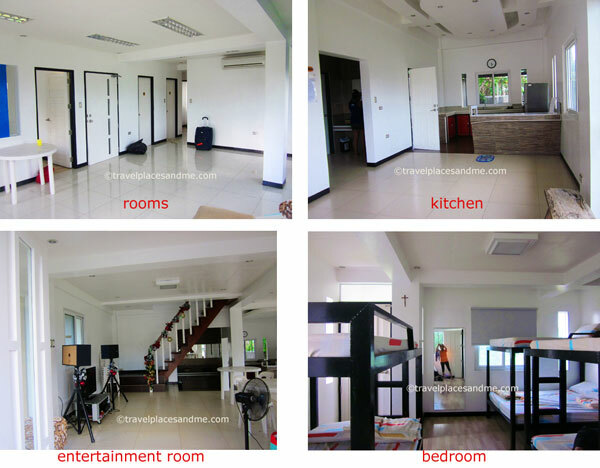 We got 3 rooms during our stay (1 master and 2 guestrooms) which are all air-conditioned and spacious. The kitchen was also spacious and we had our dinner and lunch at the gazebo where we had our buffet. There are quite numerous no. of toilets there, if I'm not mistaken there are 2 upstairs and 2 downstairs. 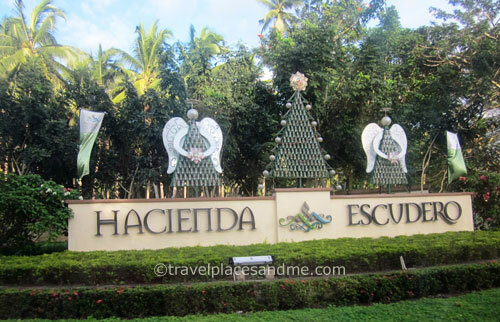 Our family went at Villa Escudero Plantation and resort for a day tour. Actually, we got lost on our way there since our rented driver didn't want to ask for directions. Arghh... if only we knew of the google map or waze app then I'm pretty sure we got there with ease. 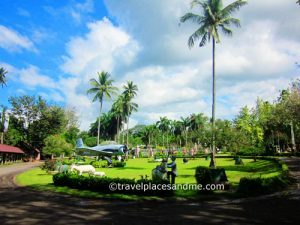 Anyway, arrived at Villa Escudero in no time and we are greeted with beautiful natural surroundings with lush trees and all. It was almost Christmas time when we visited there so there are nice Christmas lanterns and decors. We enjoyed our ride to the resort proper because a carabao-drawn cart accompanied by a musician and singers serenade us with folk songs. However, I'm also a bit sad bec. 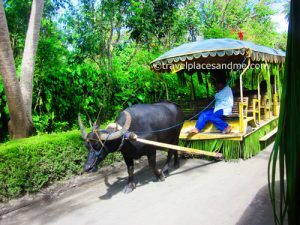 the carabao (named Mutya) must have a hard time pulling our cart because we are 18 all in all. Going there during the holidays was not the right thing to do, I must say. Why? The place is too crowded with people eating at the "fake" waterfalls that only made me dizzy because of the very strong current. 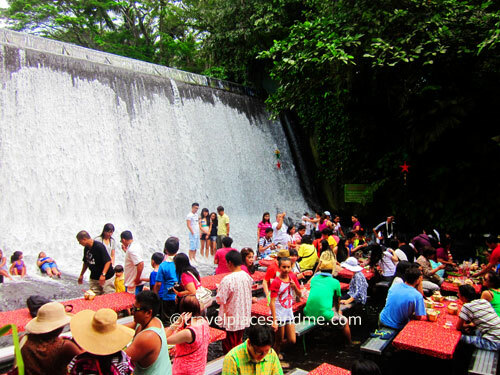 We had our lunch at hydroelectric Labasin Falls, which I said was over crowded that day being December (21). There is a long line at the buffet table and when it is our turn there's not much food left at the table. We even had to go to our buffet tables but still the same, long lines and not much food because some people put a huge mountain like food on their plates hahaha.. The staff are not quick to replenish bec. the kitchen is far from the buffet table aside from them going to the water and stepping on the big rocks. We didn't enjoy the food that we had like pansit, chicken, lumpia etc) The taste is just ok and nothing spectacular. After eating at the table with cold water on our feet, we watched a Philippine cultural show where native dances are shown, which we enjoyed. It was also fun to have picture takings with the singers and dancers wearing Filipino costumes. 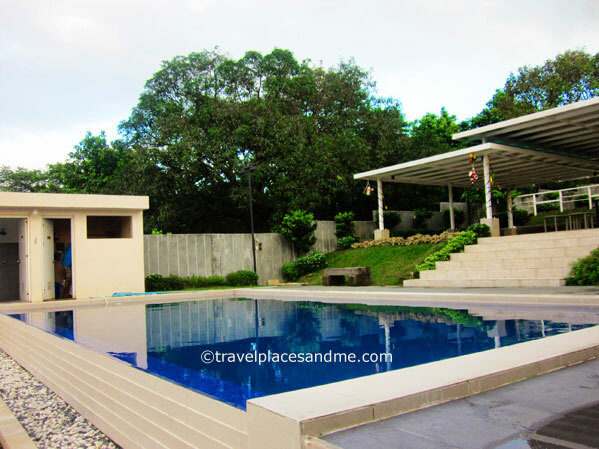 There are also pools at the back end where you can swim if you stayed at their resort. A bamboo raft was also available where you can paddle and cruise along the river and it was the activity that my nieces and nephews actually enjoyed. A life vest must be worn all the time even if you know how to swim. We also toured the family-owned church museum with tons of antique relics and artifacts. We learned that those collections are dated back from Pre-History, Spanish colonial times and World War II. 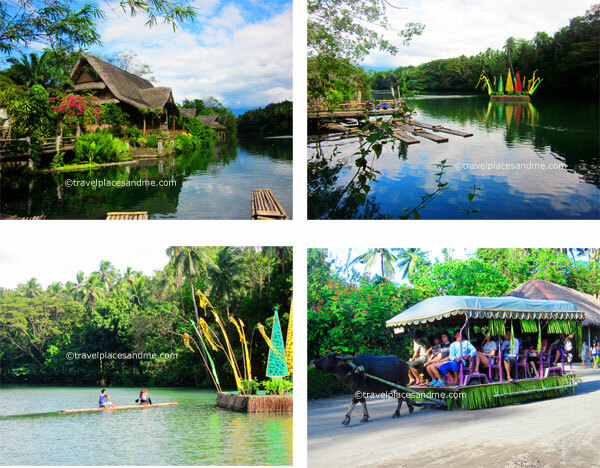 Despite the sad and annoying things that we encountered on our visit at Villa Escudero, still, we had a good time and it was a must see place too bec. 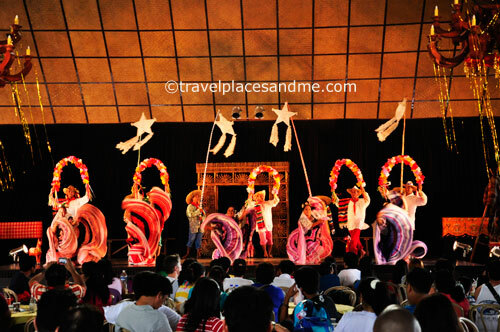 they are showcasing Philippine heritage.